Tickets for Pompey's League One trip to Peterborough are now on sale. The Blues travel to London Road on Saturday, September 15 – and it could be a top-of-the-table affair. Both sides have made an impressive start to the season. Kenny Jackett's side and the Posh have dropped just two points from their opening six matches, each delivering five victories and a draw. 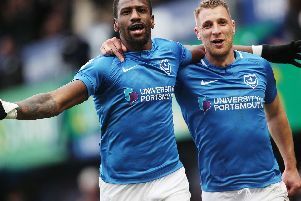 It's Peterborough who currently sit at the summit of the League One ladder on 16 points because they have a better goal difference of two than Pompey. Jackett's men host Shrewsbury on Saturday, while the Posh travel to Southend. If both teams pick up wins, the game at London Road will definitely be a first-v-second encounter. The Blues have been handed an initial 1,250 tickets for the game, located in the Motorpoint Stand. Season-ticket holders can purchase theirs today, while tickets go on general sale tomorrow at 9am, subject to availability. To purchase yours, click here or visit the club's Anson Road ticket office. Pompey suffered a 2-1 loss at Peterborough last season.